When playing sports, it is quite common to run into unfortunate situations resulting in an injury. This can have an affect on your overall performance when it comes to playing your favourite sport. No matter how cautious you are, sometimes these types of circumstances are unavoidable. This doesn’t apply to just professional athletes in the sports industry, but to anyone who enjoys physical activities as a hobby. From ligament sprains, dislocations and fractures, you should always get it checked out by a medical professional. When put in the position where you injure yourself, do not fear, physiotherapy is here to help. At Premier Care (http://premiercarephysio.com/), we will aid you with any of your injuries, putting you on the road to a speedy recovery. We are your go to sports injuries clinic in Richmond Hill, our skilled and knowledgeable physiotherapists at Premier Care are experts when it comes to sports injuries and can help you get back in the game. Why go to a physiotherapist for sports related injuries? Physiotherapists have specialized knowledge and skills and work with you to resolve the unpleasant pain you are feeling from the injury. They are healthcare experts that can treat many forms of sports injuries, here are some examples to list; joint-related injuries, sprains/strains, head injuries, muscle pain, etc. Their role is to use various types of treatments related to treating the specific pain your body is undergoing. The first step towards recovery is making sure you get an accurate diagnosis from your sports injuries professionals. They could prescribe exercise programs that employ strength and cardiovascular training. Receiving a physical assessment performed by your sports physiotherapist is crucial in achieving your health goals and customized exercise program to fit your needs. Sports physiotherapists use techniques and procedures to make the process less lengthy and as comfortable as possible. They could engage you in specific activities and training exercises to help the recovery process. Physiotherapists can also provide bracing and kinesio taping. Bracing is known for decreasing pain, improve function, reduce swelling, and can ensure more confidence in the injured body part. Kinesio taping is another technique offered to patients used by physiotherapists. This procedure refreshes the neuromuscular system to put it back on track, reduces pain and inflammation, optimizes performance and also promotes good circulation and healing. Patients can be furtherly treated with modalities, manual therapy, muscle reconditioning and proprioceptive training. A lot of times sports injuries get left ignored, therefore resulting in a lengthy recovery process. It is very important that injuries do not get disregarded because they can potentially lead to other problems. Your physiotherapy sports injury professionals in Richmond Hill can diagnose the problem and give you the correct treatments to follow. Our role is to ensure you recover safely and will be there to guide you with any of your inquiries. Your health is wealth! Take care of your body and it will take care of you. Don’t let injuries keep you from doing what you love. 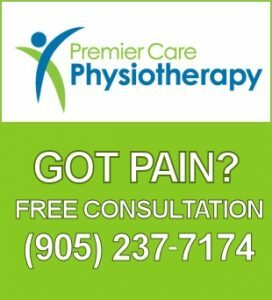 Contact us here at Premier Care Physiotherapy and allow us to help you.